Phew, I almost forgot to post this… What, with the Monday vase post yesterday, and then having a day trip to York today it’s just dawned on me that it’s sitting in my drafts folder ready for posting. 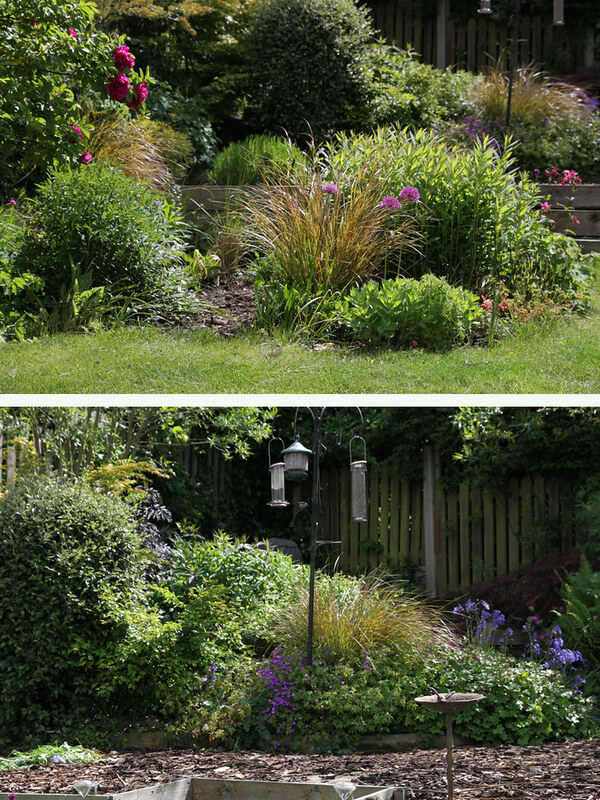 The front Garden path is looking very nice as it always does at this time of year. After ripping out some of the Geraniums earlier this year it doesn’t appear to have slowed them at all. Some tidying is needed. The Oriental poppy is even larger this year than last. It’s in stark contrast to a second I bought at the same time which is so small I struggled to even find it in the border and had thought I’d lost it at one point. Once the Geraniums have finished blooming I’ll rip some out to allow space for other plants. 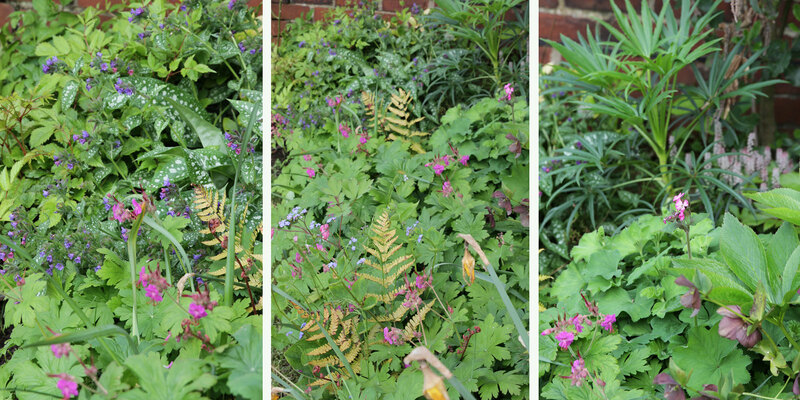 They were originally planted just to fill the border a little until the other plants matured, but now they’re taking over a little too much and the other plants are suffering because of it. 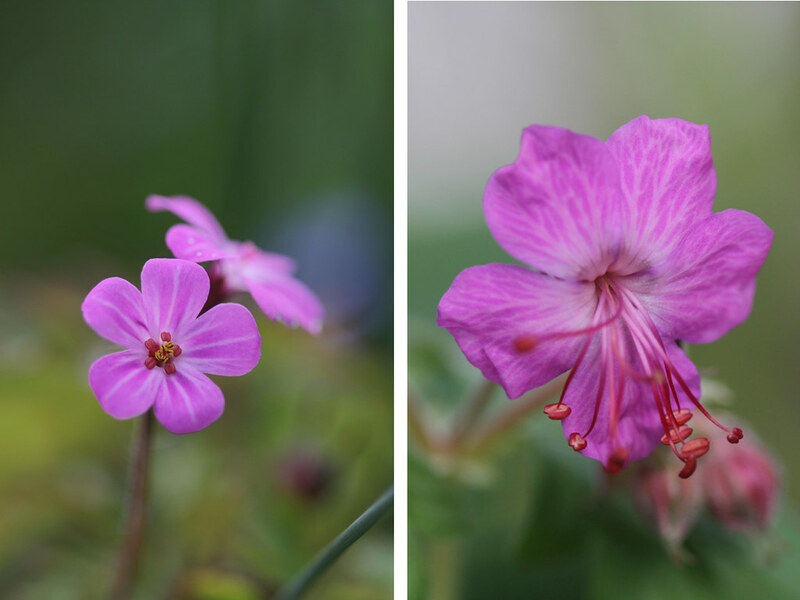 May is definitely geranium time in my garden. Perhaps I depend on the macrorrhizums a little too much and would like more later blooming geraniums. 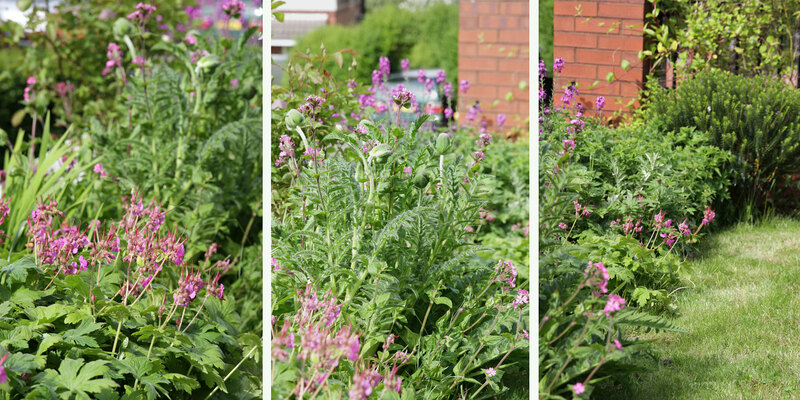 Although not all is purple… the FMN actually ruins my ‘right’ border which is a mixture of pinks and purple with some orange splashes and white. The blue was not meant for this border, but FMN will do as it will and since it’s abandoned the Buddleja border (where it’s meant to be) I’d rather have some than none. 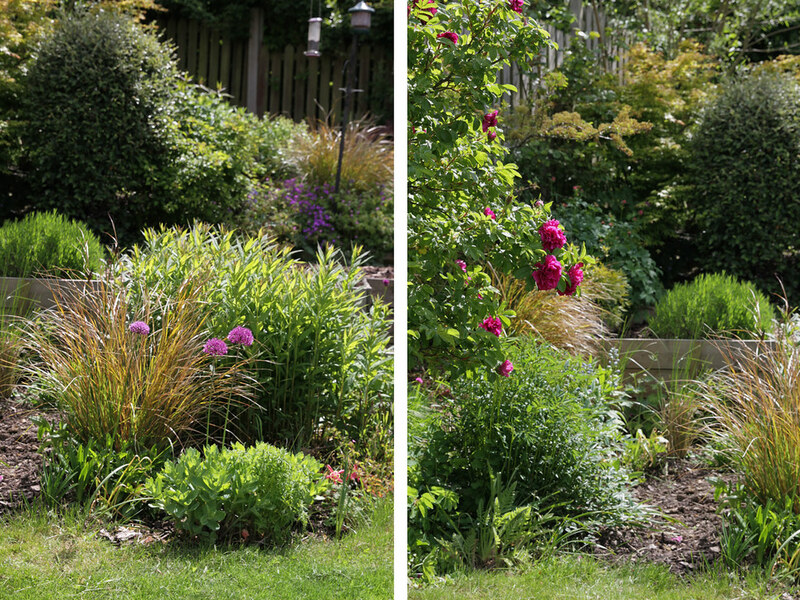 On the right-hand photo we can see a second swathe through the border that generally I cannot see because it’s hidden by the tall Aquilegia. I only discovered this patch recently when mowing the lawn. I’ve just realised I haven’t cut back any of the flat-topped aster from this border.. Usually I cut some out to keep it in check, and to stop it taking over nearby plants. Must get onto that soon before I forget where they even are. I have a feeling it’s taken over the Helenium already because I’ve been unable to find any so far. Now my cold has passed I’ll be able to bring my first roses into the house. 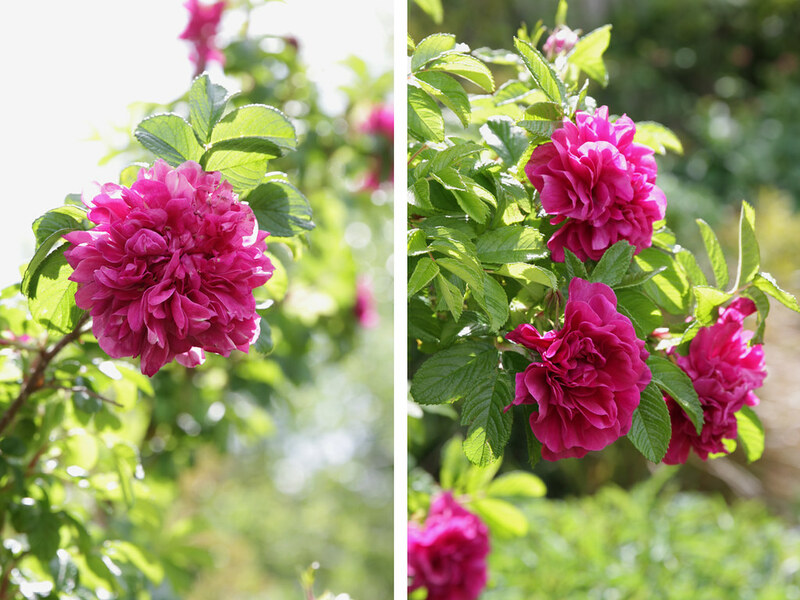 I think the heavy, wet snow earlier this year has damaged both Roseraie de l’Hay and the Russian Dwarf Almond as their branches are leaning out heavily (as you can see in the image above; the rose is creeping into the right photo) and have gaps at the centre. So once the roses are finished I’ll cut back quite heavily to try to encourage it to fill in again. After the failure of all the Cammasias to flower, I’ve removed them and added Erysimum and Salvia in their place to provide some much needed colour at the top of the Buddleja border. 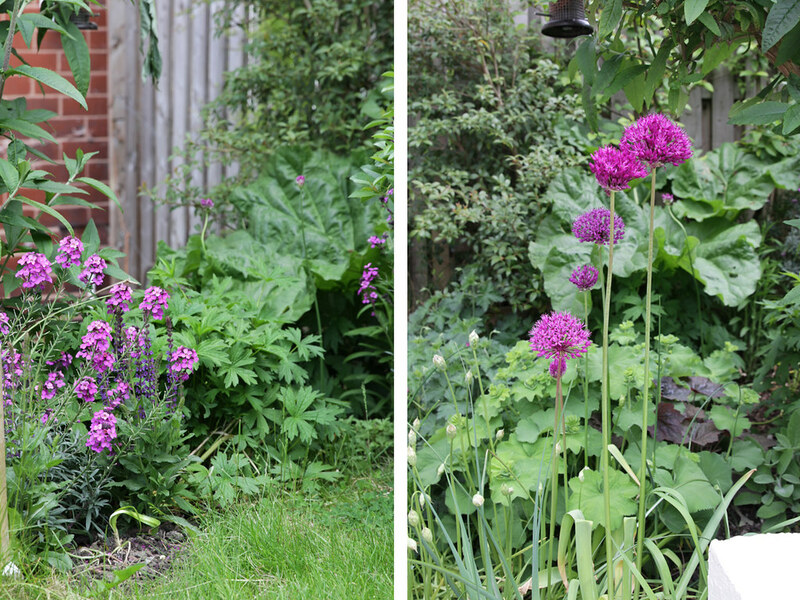 The Alliums in this border haven’t done nearly as well as those in the right border. In fact here I’ve lost Alliums and only have a handful left. Compared to the other where they’ve more than doubled. 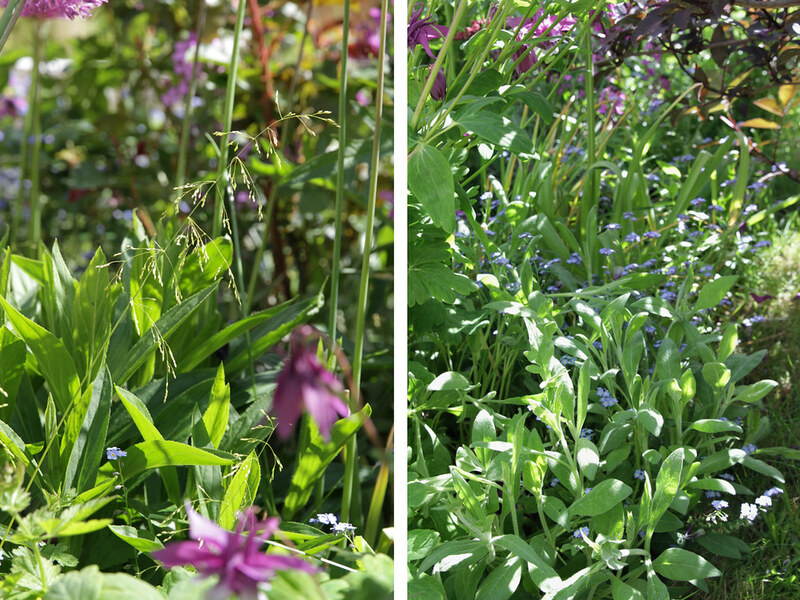 At least the chives and smaller Alliums are doing well in this border. There’s less colour as we go up the garden, the Aster border peaks in late summer and the tier depends more on shrubs than flowers. 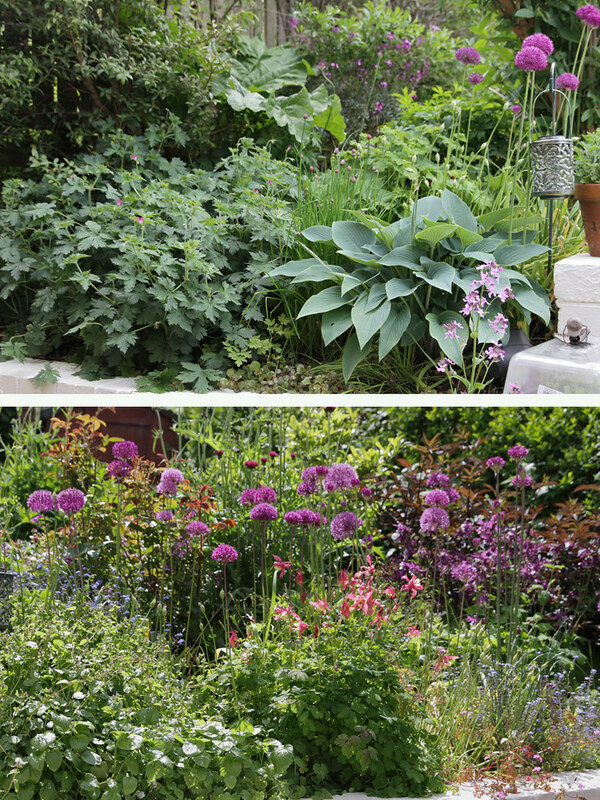 However, the upper tier will soon liven up with Gertrude Jekyll and Clematis almost in bloom. Also, even fewer Alliums have survived the Aster border… I’m sure I ought to have at least 10 in here, most likely more. Clematis Marjorie is very difficult to photograph, especially as she seems to have abandoned me and prefers to sit on the other side of the fence. Leaving me with relatively few flowers to enjoy on this side… Rather disappointing! Any attempts to bring her back are thwarted by Russian Dwarf Almond and a very spikey Roseraie de L’hay. which is in the way and I can’t get around it. 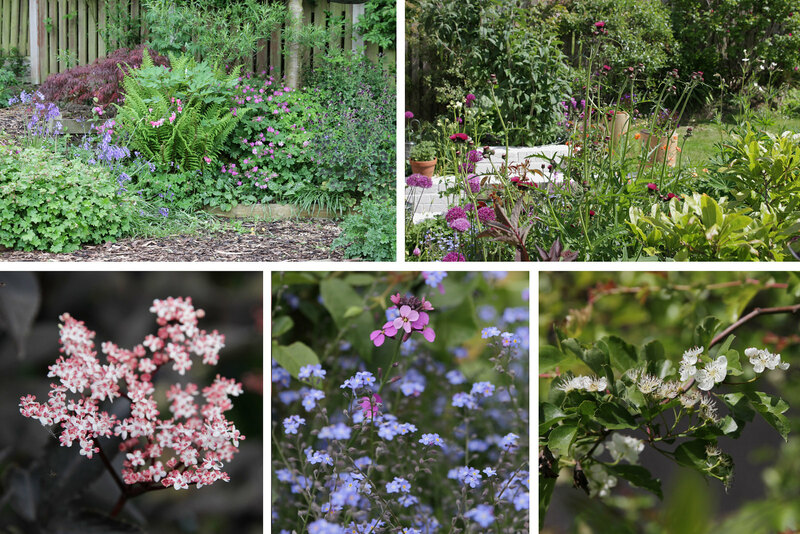 Your garden is looking amazing right now Liz. Your borders are exactly as I like them, full to bursting. We grow so many of the same plants and yours are a million miles ahead of mine. Only the alliums are flowering right now. 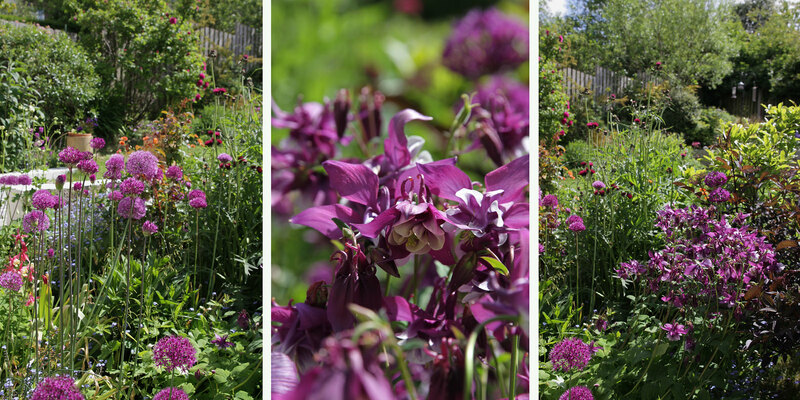 The purple/white aquilegia is very pretty, very similar to A. William Guiness but not quite so dark. Very pretty indeed. Glad to read your cold has gone, I’m sure now you’ll be feeling like doing a spot of gardening. Hope the weather stays good for you. I’ve given up on the weather this year! Your borders are a delight. I am impatient for mine to fill up like that.! Liz I love seeing your gardens. 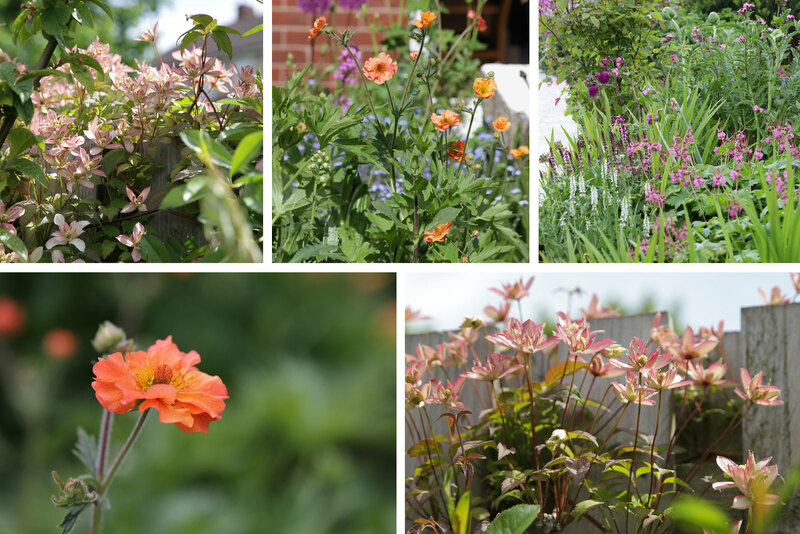 My geraniums also seem to have taken over and the poppies are big this year here too….I love all the purples and pinks and the orange geum is a favorite of mine and is still growing in my garden.